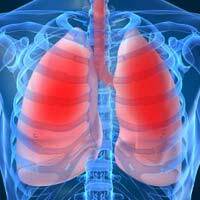 Home > Bacteria & the Lungs > Which Bacteria Cause Pneumonia? Pneumonia is a medical term used to describe lung inflammation. This can be due to a wide variety of causes only one of which is a bacterial infection. Pneumonia can also develop as a result of a viral infection, infestation by a parasite or fungus, or through chemical damage to the lungs. This is usually a consequence of inhaling a toxic and damaging gas or the fumes of a volatile liquid. Lung inflammation is usually serious and life threatening. The lungs contain thousands of tiny air sacs called alveoli that normally fill with air every time we breathe in. The oxygen from the air in the alveoli passes across the alveolar wall into the fine blood capillaries that wind their way around the outside of the air sacs. This is how we obtain the oxygen that is required by every cell in the body. If the lungs become infected with bacteria these tiny sacs become filled with inflammatory fluid and pus, which is formed from dead bacteria and dead immune cells. Alveoli that are full of fluid and debris cannot fill with air, so less oxygen gets into the body. This creates the breathing difficulties associated with pneumonia and a severe cough also develops to try to rid the lungs of the fluid and mucus. The lack of oxygen causes havoc in the rest of the body and can lead to multi-organ failure and death. The pneumonia caused by bacterial infection can develop after infection with a huge range of different bacteria. The most common pathogenic agent responsible for bacterial pneumonia is Streptococcus pneumoniae. This is usually the cause of pneumonia in adults. Most healthy adults are not particularly prone to pneumonia but a preceding respiratory infection caused by a virus can cause enough lung damage to open the body up to a secondary infection. People who have weakened immune systems, maybe because of alcoholism, kidney problems, chronic drug use or another underlying illness such as cancer or cystic fibrosis are more likely to develop pneumonia. Other Streptococcus bacteria that cause typical pneumonia include Streptococcus pyogenes and Streptococcus agalactiae. This second bacterium is a commensal organism in the genital tract and it can cause pneumonia in newborn babies. It does not happen too often, but the baby sometimes inhales fluid containing the bacteria during its journey down the birth canal and develops pneumonia soon after birth. Staphylococcus aureus often causes pneumonia in people who have cystic fibrosis. This is a genetic disorder caused by a fault in one gene, and it leads to many different symptoms, including the inability to clear mucus from the lungs. Cystic fibrosis patients are therefore at high risk of all respiratory infections. Other bacteria that are commonly linked with pneumonia include Klebsiella pneumoniae, Escherichia coli (the same E. coli that lives as a friendly bacterium in the digestive system), Pseudomonas aeruginosa and Haemophilus influenzae. There are many other bacteria that infect the body and cause pneumonia as just one of many symptoms and signs. These conditions are usually known by a medical term that describes the whole set of symptoms. Anthrax, for example, is caused by infection by Bacillus anthraxis but the most serious consequence of this infection is pneumonia. Similarly, Q fever, which is caused by Coxiella burnetii, results in lung inflammation, as does Legionnaires disease, caused by Legionella pneumophila. All cases of pneumonia are potentially life threatening and are treated very seriously. If the affected person has difficulty breathing, they are usually admitted to hospital to be given extra oxygen and help with breathing as necessary. For many people, however, a period of rest at home under medical supervision and appropriate antibiotic therapy results in recovery within about 3 weeks. It would be ideal to find out the specific cause of the lung infection before antibiotics are prescribed, simply because there are so many bacterial causes for pneumonia. However, despite investigation using swabs and cultures, it is still impossible to identify the causative pathogen in half of all patients with pneumonia. A standard therapy is therefore commonly used based on amoxicillin or erythromycin. Any patients that do not respond are given other classes of antibiotic and carefully monitored.